Another day of beautiful Hawaiian sunshine. Today, I was the early riser (I think my inner clock isn't set to Honolulu yet). So, while Kyle and Grace slept, I sat on the balcony and watched the ocean. And I can't think of a better way to wake up. 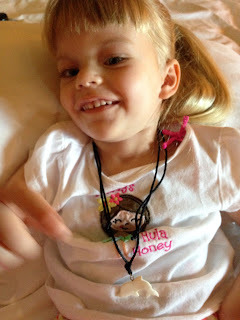 Daddy's hula honey ready to head out and meet her dolphin! Once everyone else was up and going, Kyle ran down to our favorite "grab and go" cafe to bring some breakfast up. We've been doing some meals in the room just because it's easier, but we are excited for a character breakfast on Friday morning and a nice dinner at Ama Ama before we go home. After we ate, it was time to get ready for Grace's dolphin encounter. I was a little nervous about driving to the park from our resort, but Kyle always takes good care of us, and got us there safe and sound. It was about an hour from Aulani, and we enjoyed the scenery and driving by the Pacific Ocean. 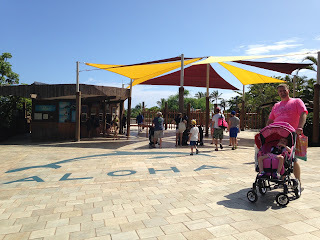 Aloha from Sea Life Park, where they filmed park of 50 First Dates! When we got to the park, we found out it's where they filmed part of the movie, 50 First Dates with Adam Sandler and Drew Barrymore, so that was really fun! Oh, and Kyle already promised me a movie date night when we get back home so we can watch and see where we were! Grace and I feeding the birds! Those who know us well probably won't believe that we actually arrived at the park about a half hour before we were supposed to check in! Kyle feeding the birds . . . So, we started off in the shark cove, where they had indoor viewing windows to see hammerhead sharks and other fish. We also stopped by to see the green sea turtles. 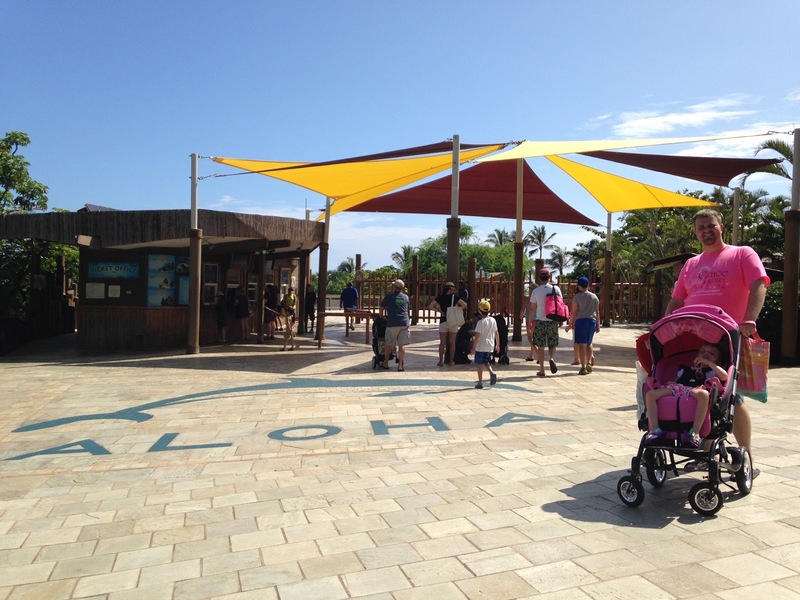 They offer a variety of sea life to see in their zoo-like park. 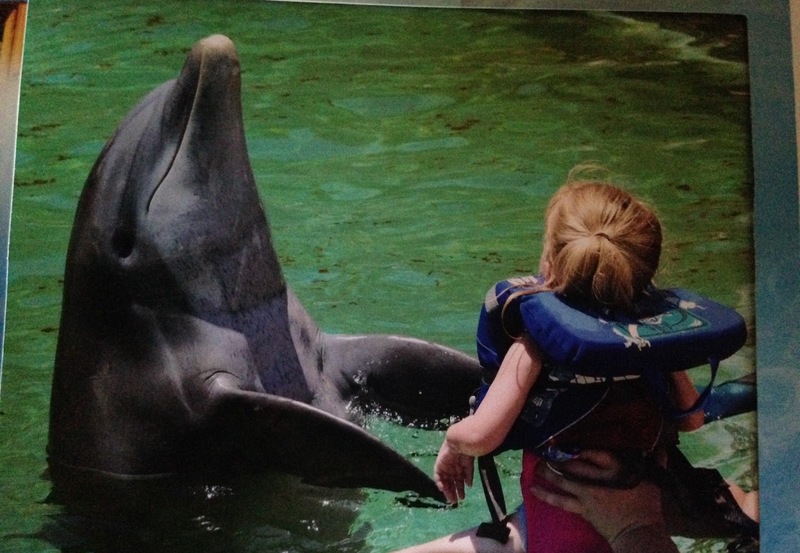 Grace's photo while she was dancing with Laka the dolphin. 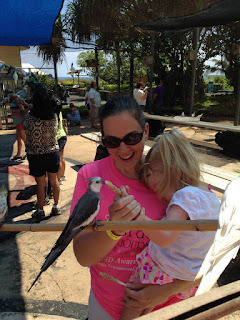 After we got checked in for Grace's dolphin experience, we had a few more minutes before it started, so we visited the bird exhibit, which was one of the neatest parts of the park. When you entered the fenced in area, a staff member gave everyone a stick with birdseed on it, and you could take it to the birds. Sometimes, they would even stand on the stick. It was a little surprising until you got used to it. Kyle had a little more trouble getting used to it, as the birds flew about his head level, and flew right over the top of him. 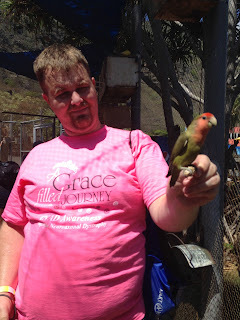 Grace and I had a good time, and she even held the stick to feed some of the birds. Mommy got a chance to kiss Laka the dolphin too! Then it was time for the big moment! We got our life jackets and all our instructions, and were with a group of about ten people or so for the dolphin encounter. 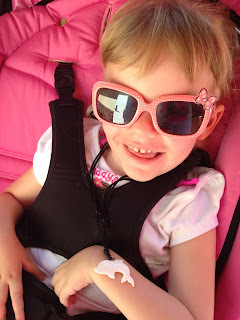 It was a bit warm out today, and Grace had a little trouble with the bright sunshine. You couldn't take anything like sunglasses into the dolphin area, so she closed her eyes some before it started. But as soon as it started, she immediately got a big smile on her face, and started splashing in the water. The trainer introduced us to one of the dolphins featured in the movie 50 First Dates, and we got to give him belly rubs and back rubs. Several of the dolphins did tricks right in front of us, and then Grace got to meet Laka and get her photo taken while she was kissing it and dancing with it. 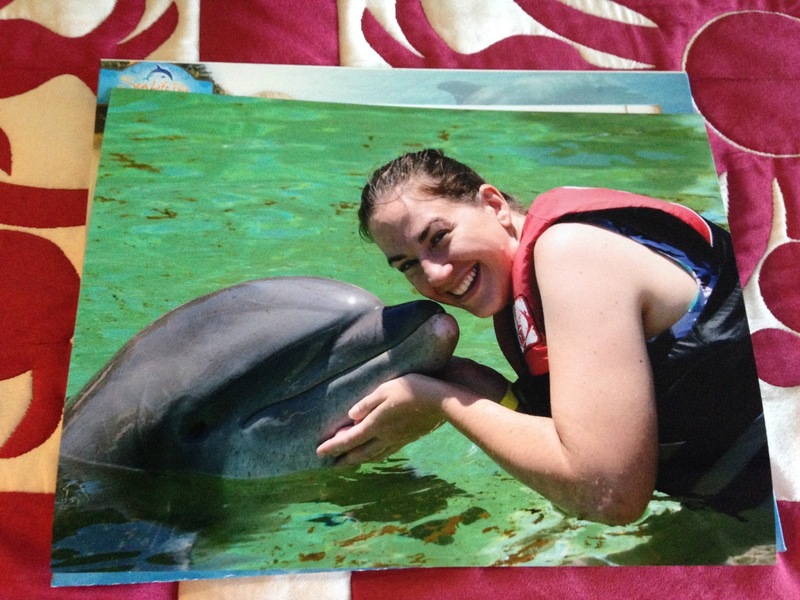 The bright sun was kind of getting to her, so she was a little fussy during the actual photo part, but she really seemed to like being in the water with the dolphin. 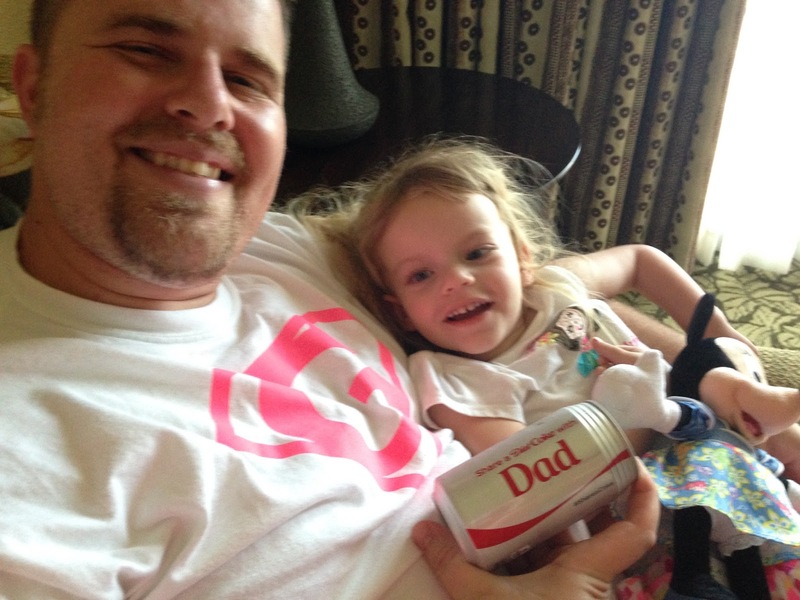 Relaxing in the hotel room, and daddy got a pretty special Diet Coke. After our dolphin encounter, we intended to eat lunch at the famous hot dog stand, Pink's, which is located at Sea Life Park, but Grace and I got a bit too hot at the park, so we opted to return to the hotel and get some lunch when we got back. And then, we decided we would get some rest before the big Starlit Hui show, which is one of the favorite Hawaiian shows at Aulani. Our friends in the Pua Hana room reserved a special spot for Grace. She still thought there was too much to do and didn't take a nap, but we rested together for a bit. This is Grace playing her shaker during the hula session. As we were enjoying a snack on the couch, Kyle got a call to say that the Starlit Hui show had been cancelled tonight because of the weather, but that there was a Hula lesson in the Pua Hana room in just a few minutes. So, we headed that way. It was similar to the surf party on yesterday, and the leader explained some of the history of the hula dance, and Grace even got to try out one of the instruments for the song. It was similar to a maraca shaker, but with feathers. She really seemed to like it. Then she and I tried the hula dance together. 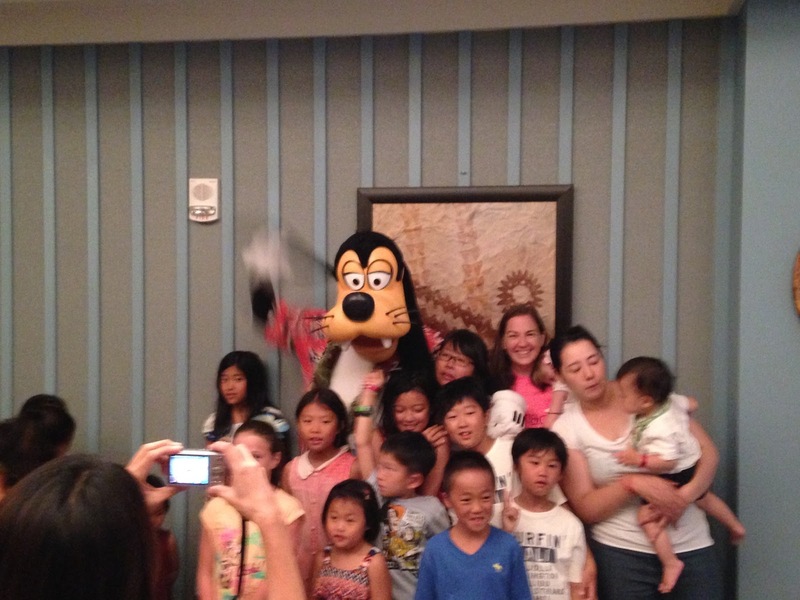 We got some pretty good moves, and it got even better when Goofy came to visit and dance with us. 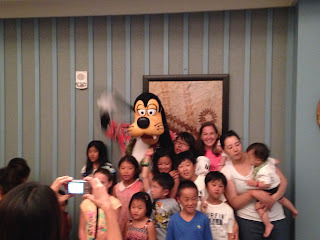 Goofy came to dance the hula with us! As we were getting ready to leave, some of the staff said there would be a character meet and greet in just ten minutes, so we stayed, and it was another chance to see Mickey and Minnie! Grace was much more tired today than yesterday, but Mickey remembered how much she liked peek-a-boo and really tried to get her to smile. No luck with a smile tonight, though. She was just too tired. They told us Chip and Dale would be back in a half an hour, but we decided we would try to catch them another time. 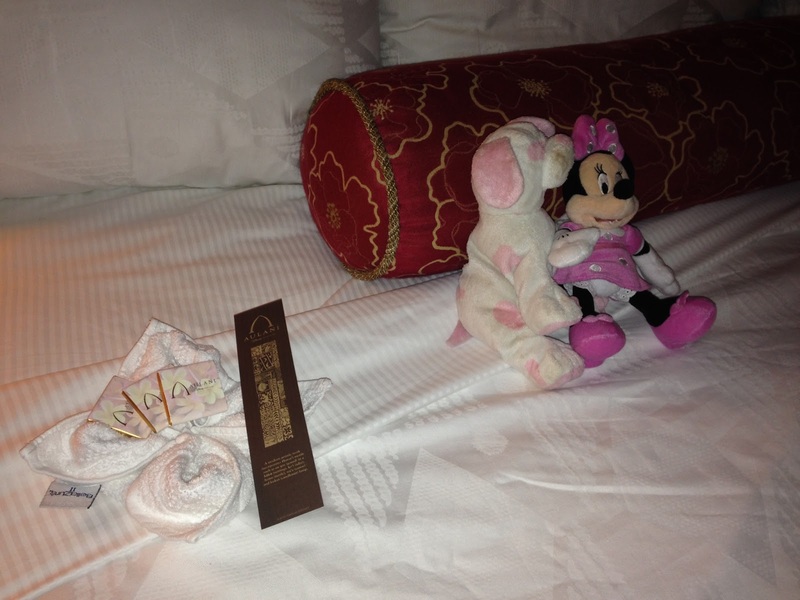 Everyone at Aulani has been so helpful in making sure we enjoy our stay. When we got back to our room, the turn down service left a flower wash cloth and some chocolates, right next to Bruce and Minnie. 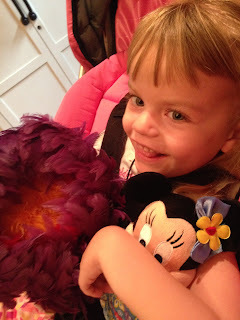 After visiting with Mickey and Minnie, we stopped at the grab and go cafe again for some dinner, and Grace got a Mickey shaped peanut butter and jelly sandwich, and she shared some sushi with her daddy. Her mommy got some fresh Hawaiian fruit that was delicious. 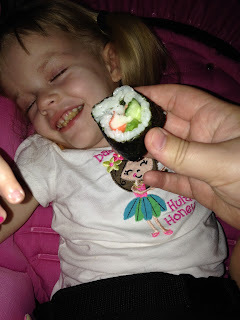 Grace sharing some sushi with her daddy! After a bath with her dad, Grace laid on my lap for her evening protein drink, and she fell asleep across my lap with her straw still in her mouth. She rarely falls asleep in my lap, as she prefers to be in her bed and have me read books to her, so I savored every single snuggle in paradise. It was another really great day in Hawaii, and we can't wait for tomorrow! 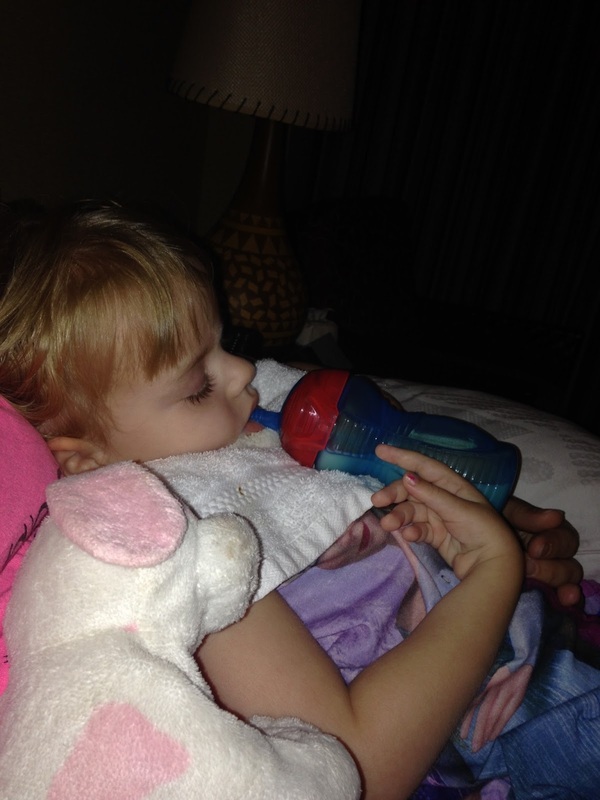 She fell asleep across my lap with her cup still in her mouth. I just enjoyed all the snuggles! Love her sleepy photo! Ps I want a super G shirt! Those would be a hit!! How cute!